What a weekend it was. There was of course the minor issue of the Queen and and the whole country celebrating the Diamond Jubilee. And celebrations they were ! In true style and torrential rain the mighty Thames hosted over a thousand boats in a river pageant in honor of HM that organisers will struggle to match in the future. 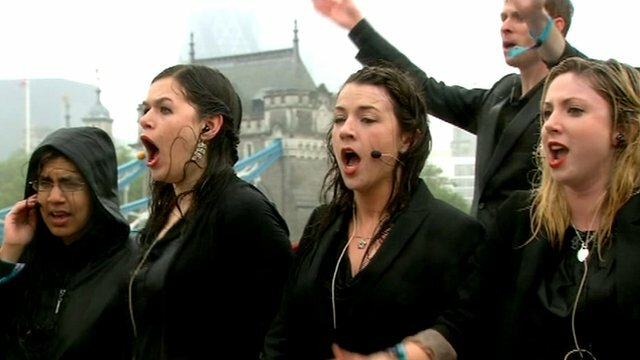 My favorite moment by far was the Royal Philharmonic choir singing there hearts out while being literally soaking wet. There is absolutely nothing that gets the British Spirit down and that is one of many reasons why I love to life here. But there was of course another grand event taking place in a small conference center in the lovely South Kensington. 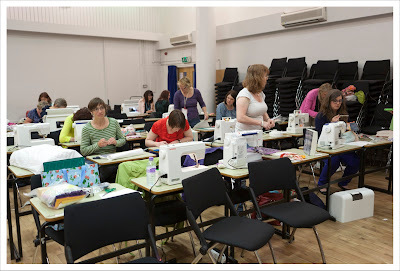 About 100 quilters had gathered for the first long awaited Fat Quarterly retreat ! The preparations for this splendid weekend were long and plentiful. Name tags were swaped, fabric was bought and finally humongous suitcases were packed with fabric, tools, sewing machines and a few pieces of clothing for those that came from afar. Quilter arrived from all over the world. I met those coming from Oz, Canada, the Czech Republic, Holland, Switzerland, the US and Germany and of course lots and lots of Brits ! I don't know what other participants expectations were but mine were to learn something new in the classes I had booked and to meet as many people as I could. Were my expectations met ? Oh yes they were and much, much more than that. I enjoyed every minute of the retreat. It was fantastically organized by the Fat Quarterly team and it was apparent that they put not only a lot of thought into this but also a lot of heart. I loved that multiple courses took place in the big hall so you could walk around and see what other people were up to. The atmosphere was so very friendly and communal and that made everybody feel at home. I am sure that was one of the team's prime aims and they achieved this with full marks. I attended three course and learned something new and valuable in each of them. I met all of my fellow Brit Bee members and that in itself was just wonderful. It means so much more to talk to somebody who is sitting in front of you than through flickr streams and e-mails. I am sure each of us discovered a lot of new things about one another. I met so many new quilters and saw so many wonderful quilts. I laughed so hard and often and even had a lump in my throat when I finally saw our finished project 51. It was a fabulous weekend in every way and for that I would like to say THANK YOU Fat quarterly team. You have done an amazing job and I sure hope you will make this a regular feature (no pressure there or course). So let me show you what I learned and crafted over the weekend. First of Saturday morning I had a class with the fabulous Lucy Summers. I was very keen on learning her famous porthole technique and this was possibly my most eagerly anticipated class. Lucy ran a great class and all of us managed the technique by the end and some even went on to graduate making a heart. The porthole sample she made us sew was a three hole piece and I chose to use some of my Melody Miller fabric for this. I forgot to bring some colourful solids but Amy was kind enough to lend me some of this fabulous green. Back home yesterday I was keen to do something with the block and so I added a fourth hole around it and made the whole thing into a cushion ! This is a fantastic technique and once you actually got it (which shows itself in a very pronounced AH effect) then it is a breeze. I love it and will definitely use this in a future quilt. 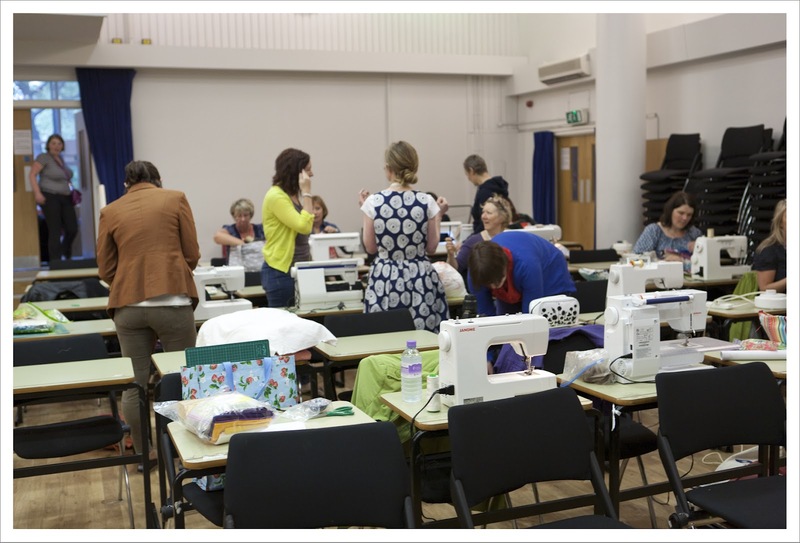 Next on the agenda was an EPP workshop with Tacha. This was a great class as we all sat around a large round table. It was so relaxing and we all chatted and for a while Brioni (also from the FQ team) joined us too. 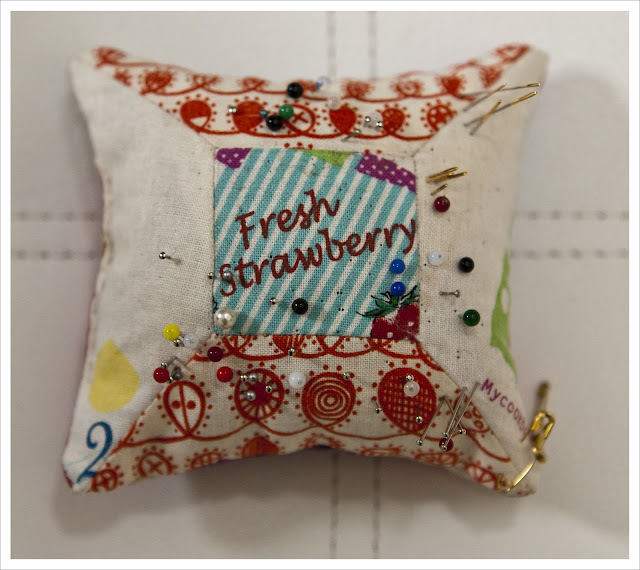 The aim of the class was to learn the technique and possibly start towards making one of two pillows Tacha had brought as samples. Already when I finished the first couple of hexies I was hooked and decided that I would not make a cushion (oh NO) but a quilt of neutral hexies. That of course will take time but I found that this is not only a relaxing technique but lends itself very much as an in-front-of-TV or craft-on-the-go project which is something I always need . Brioni told us that she can make a king size EPP quilt in 6 weeks. I won't be doing that but I am impressed by this speed (if not slightly scared) . Both ladies evidently life and breath Englich paper piecing and Tacha just published her first fantastic book on the subject. My last class was on Sunday morning and this was another eagerly anticipated one by me; Freezer paper piecing. I wanted to find out what it was all about and what the difference between normal; i.e. 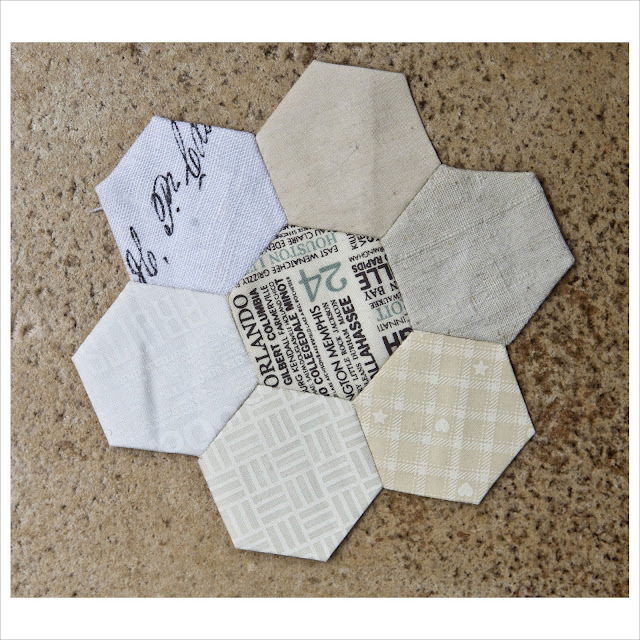 foundation paper piecing and freezer paper piecing is. Kerry of verykerryberry tought this class excellently and made a point of showing everybody the finished pieces throughout the morning. We had the choice of making pin cushions or an intricately pieced house. 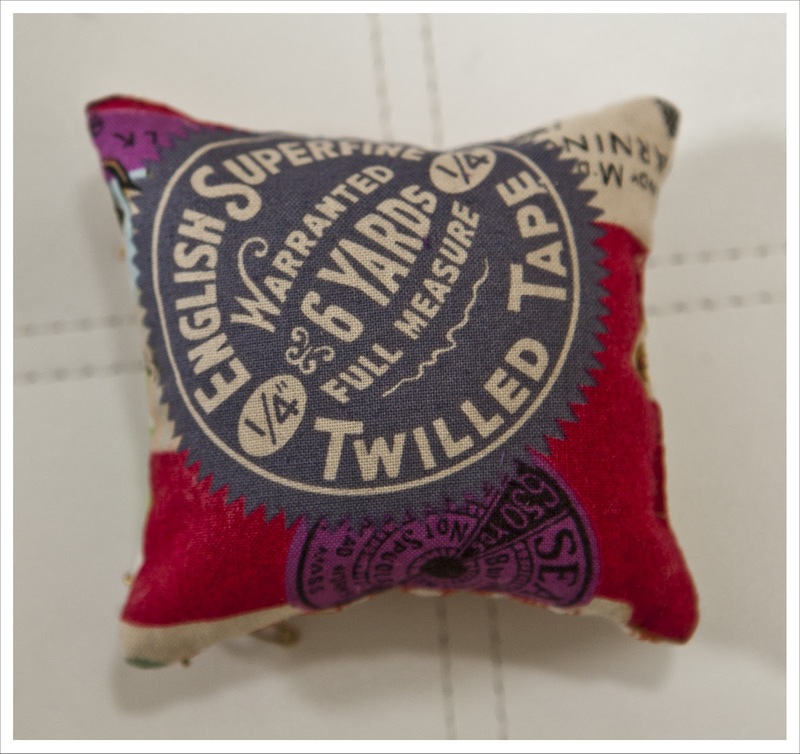 I decided on a pin cushion as you know I have a soft spot for them. It turns out that freezer paper piecing lends itself excellently to the piecing of the dreaded Y seams. I was pleased with how my pinni turned out (filled with my customary rice and lavender mix; I do love a heavy and fragrant pinni !). I will definatly use this technique again in smaller items such as pin cushions but possibly not on a large quilt as it is rather labour intensive. I have sewn Y seam on a large quilt before and whilst it is difficult you can get the hang of it after a while. It is also somewhat easier on larger pieces. So that was it. A great weekend that I will not forget for a long time ! I hope you had fun too and would love to hear your stories. Thanks for a brilliant post - I love the cushion and pin cushion you made and your hexy quilt is going to be fabulous!!! I loved meeting you Judith. And the weekend was brilliant! Love the portholes cushion - talk about being an overachiever! Thanks for this very interesting post on the retreat. Your classes with the new techniques sounded fascinating, especially the porthole one. Did see you Judith but not sure we spoke but glad to have seen the face behind so many lovely makes! 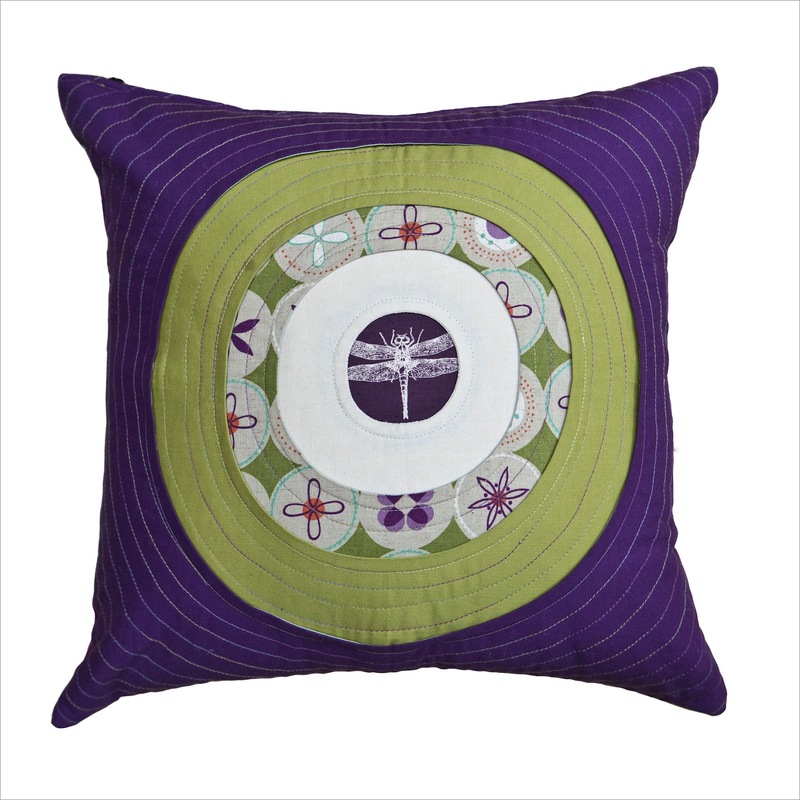 Well done on the Porthoe cushion! I didn't get to meet you Judith :-( I was only there on Saturday and it was a manic day, but so amazing. Hoping it will be repeated next year! So glad everyone had a good time. 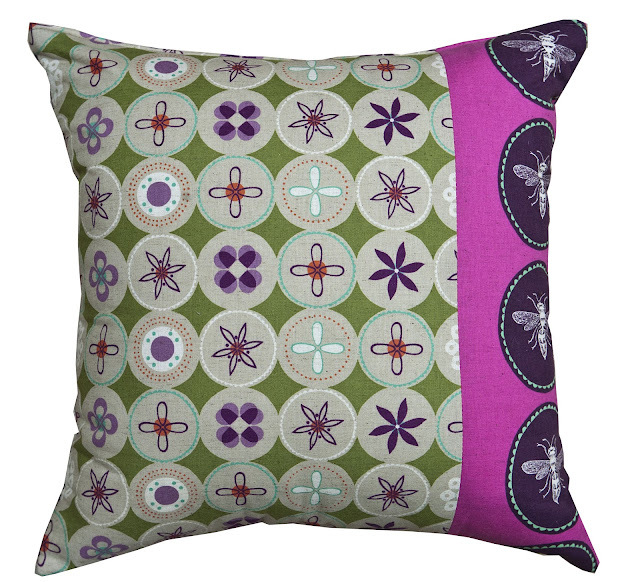 Love, love your cushion! I have never heard of the porthole technique, but it is fantastic! It was so nice to meet you in person and to see your wonderful quilts too. I love the pillow you made from the porthole, I might do that with mine too. I love the things you made in class. That pillow is amazing! What a lovely post, felt like I was there again- as a result making my eyes tear up! Loved your fragrant and weighty pinnie and your fab fabric choices! Your finished portholes cushion looks great, mine is still packed- I really need to get my machine and everything else unpacked this afternoon! Wow your portholes cushion is amazing, I need to think of something to do with mine still! 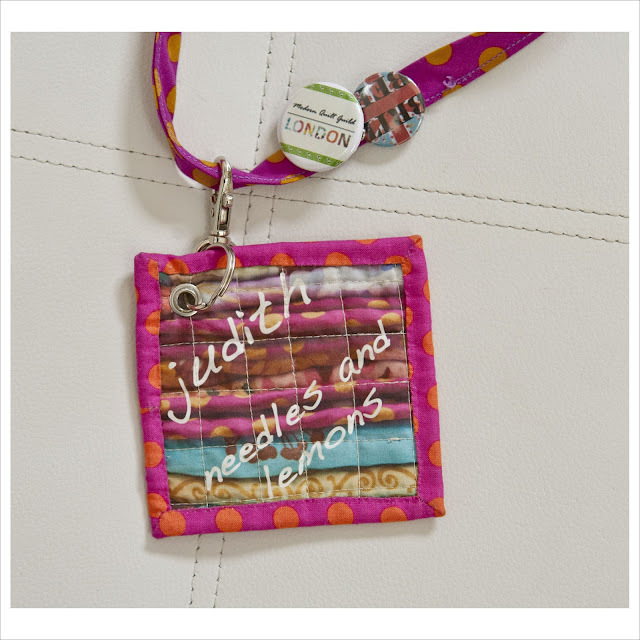 Judith, I'm intrigued, where do you get your fab quirky fabrics from like those used in your pincushions? In fact I love all the fabrics in your portholes cushion too - think I may put you in charge of fabric buying for me, too! I bought the porthole fabrics at the Eternal Maker, they are Melody Miller's last year Spring collection called Ruby Star Spring. 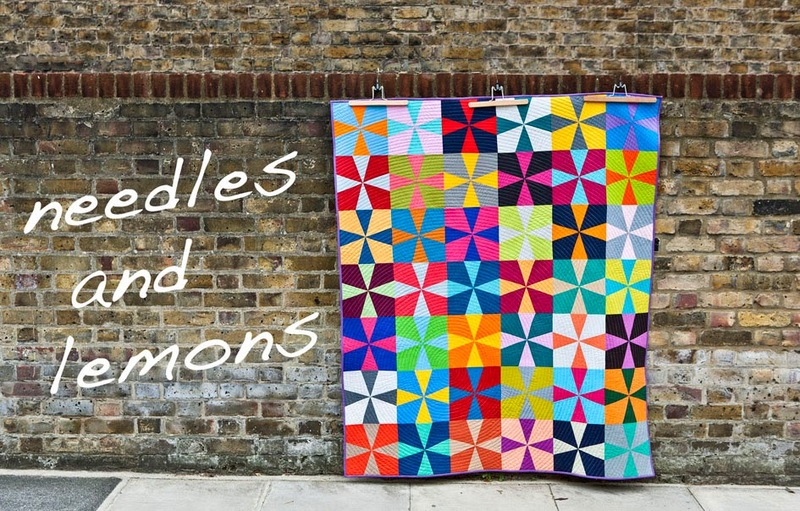 You can still find some of the prints here: http://www.eternalmaker.com/fabric/fabric-by-collection/ruby-star-spring-melody-miller. The green solid is actually not from my stash but from Amy's so you need to check with her. The purple solid is from Kona and the colour is called Hibiscus. The pieces in the pincushion are a bit more tricky. The curly patterned is the easy one as it is from Lucy Summer's new Summersiville collection which you can buy also at the Eternal Maker but also at Annie's shop (Village Harbedashery). The strawberry print and the the other cream bits to the sides are all from one little print that I got sent via Etsy as a little gift while making a purchase. But I actually can't remember which shop I made the purchases at the time. The back of the cushion is a Lecien print called 'Vintage Art Store' and you can buy it at here: http://www.celticfusionfabrics.com/ourshop/prod_1376747-Lecien-Vintage-art-store-red.html. One more tip from me would be to enter into the Japanese swatch club at the Eternal Maker. It is about 28 GBP and you get sent every months some lovely Japanese swatches that are ideal for the piecing of little things. It was wonderful meeting you Judith. I hope to see the neutral hexies turn into something larger. But you don't have to do it in 6 weeks! I promise!